Posted on 15, December 2015 by EuropaWire PR Editors | This entry was posted in Automotive, Awards, Germany, Industrial, Netherlands, Technology, Transportation & Logistics and tagged Wilhelm Rehm, ZF Friedrichshafen AG, “ZF Supplier Awards”. Bookmark the permalink. Friedrichshafen/Amsterdam, 15-12-2015 — /EuropaWire/ — ZF Friedrichshafen AG recognizes its outstanding suppliers with the “ZF Supplier Awards.” This year, the technology company handed out a total of 14 awards in different categories. This year’s eighth awards event was also a premiere: The first global Supplier Summit, with ZF and ZF TRW jointly presenting the “Supplier Awards”. E. Winkemann GmbH emerged from a multi-stage process as the winner of the “Innovation” category. For over 20 years, the company from Plettenberg has been supplying ZF Friedrichshafen AG with precision punching parts that are installed, for example, in every one of the company’s 8-speed automatic transmissions – including the thrust washers, which absorb axial loads during a rotating movement. The countries of origin of the award winners in the “Production Materials” category perfectly reflect ZF’s global orientation. The eight award-winning companies are headquartered in seven countries: MAT Foundry Group (Great Britain), Staamp (Italy), Murata Manufacturing (Japan), Sunil M-Tech (South Korea), Grüner Systemtechnik, UTT Technische Textilien (both Germany), WR Controls (Sweden), and Taigene Electric Machinery (Taiwan). Winners in the “Non-Production Materials” category include Balluff GmbH, which has supplied ZF with sensors and systems for assembly lines, as well as Kontane Logistics, a tried-and-trusted logistics partner from the US southeast. The Esslingen-based, family-owned and operated company Festo has been supporting ZF for decades with factory and process automation solutions, and Turin-based specialized machine manufacturer Vigel, which recently equipped the new ZF TRW plant in Zhangjiagang with processing centers, were also among the award recipients in this category. Fuchs Petrolub earned a special award as the 2015 Global Supplier of the Year. The company supplied 21 000 tons of oil and lubricants to ZF in the past year. The jury praised the high quality and flexibility of the Mannheim-based suppliers. Additionally, Fuchs Petrolub is also active in the special ZF growth markets thanks to their own production location. “In order to remain a global benchmark, we are striving to be the leader in both innovation and cost efficiency. In this regard, our suppliers’ contribution is substantial.” Wilhelm Rehm, member of the Board of Management responsible for Corporate Materials Management among other things, underlined the significance of innovative, globally active and reliable suppliers, the best of which have received the “ZF Supplier Awards”. ZF is a global leader in driveline and chassis technology as well as active and passive safety technology. The company, which acquired TRW Automotive on May 15, 2015, is now represented at about 230 locations in some 40 countries. The two companies, which were still independent in 2014, achieved a sales figure exceeding €30 billion with 134 000 employees. As in previous years, both companies have invested approximately 5 percent of their sales in Research and Development (recently €1.6 billion) in order to be successful with innovative products. ZF is one of the top three automotive suppliers worldwide. In 2015, the company is celebrating its centennial. Originally named Zahnradfabrik GmbH, ZF was founded in Friedrichshafen in 1915 by Luftschiffbau Zeppelin GmbH among others. In its early years, the company developed, tested, and manufactured aircraft transmissions. After 1919, the company focus shifted under Alfred Graf von Soden-Fraunhofen, the first Managing Director and later member of the Board of Management and CEO, to the automotive and commercial vehicle industry. In this sector, the company established itself once and for all as a major technology supplier, registering numerous patents for innovative transmission technology. The first location outside Europe was founded in Brazil in 1958, launching a globalization drive that still continues today. In addition, ZF constantly expanded its range of expertise – also through acquisitions. For instance, in 1984 ZF acquired the majority share in Lemförder Metallwaren & Co. KG, a move which expanded the product portfolio to include chassis technology. In 2001, ZF took over the former Mannesmann Sachs AG to strengthen its value added chain with driveline and chassis components. It adopted the current name of ZF Friedrichshafen AG in 1992. Today, the Group’s product range comprises transmissions, driveline and chassis components, driver assistance technologies as well as complete axle, braking, and steering systems. ZF products are used in passenger cars, commercial vehicles, construction and agricultural machinery, rail vehicles, and marine applications. The company also focuses on the wind power and electronic components business. In addition, ZF Services represents the Group on the international aftermarket. In May 2015, ZF completed the acquisition of the U.S. automotive supplier TRW which had been previously announced in 2014. The shareholders of ZF Friedrichshafen AG are the Zeppelin Foundation, administered by the City of Friedrichshafen, holding a share of 93.8 percent, and the Dr. Jürgen and Irmgard Ulderup Foundation, Lemförde, with 6.2 percent. The “Motion and Mobility” slogan clearly states the company’s core mission: Right from its foundation, ZF has developed and manufactured innovative products for all people around the globe who want to move things reliably, comfortably, and safely and experience the ultimate in efficient mobility. Quality, technological leadership, and innovative power have always defined the Group’s identity – today as much as ever. Oil and lubricant specialist Fuchs Petrolub is one of the 14 top suppliers that ZF awarded with a “Supplier Award” in different categories. 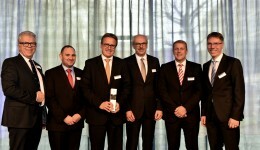 Wilhelm Rehm, member of the ZF Board of Management responsible for Corporate Materials Management (third from the right), gives the “ZF Global Supplier Award” to company CEO Stefan Fuchs (third from the left).